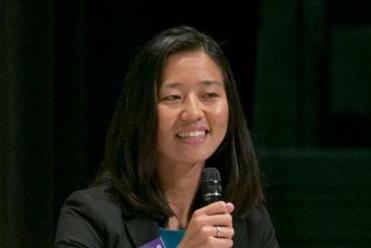 Michelle Wu campaigned in South Boston. Born and raised in Chicago, the daughter of Taiwanese immigrants, Michelle Wu first moved to Massachusetts in 2003 after earning a scholarship to Harvard University. She lived in Cambridge while attending classes, but often ventured to the other side of the river, where she helped teach English classes in Chinatown. Soon, she was enamored with the pace, diversity, and energy of Boston. But the love affair would be short-lived. After graduating and taking a job in the Financial District, Wu found herself headed back to Chicago after her mother began suffering from a serious mental illness. Wu became the primary caretaker of her mother, as well as her two younger sisters. To support the family, she started a tea shop. That experience of going through the strenuous process of launching a business helped fuel her interest in the unique role of municipal governments. Read Michelle Wu’s responses to the questionnaire. “What I learned is that a complicated permitting system can be really frustrating,” Wu said. But it was not long before Wu found herself returning to Boston to attend Harvard Law School. She sold the family business, packed up her mother and sisters — for whom she was still the primary guardian — and moved them with her. Just a few years later, bright purple signs displaying her face and name are plastered around much of Boston as she seeks one of four citywide seats on the City Council. The 28-year-old lawyer, who has won the support of many heavyweights in Boston’s liberal establishment, has been perhaps the most discussed candidate for the council’s four at-large seats. Her campaign kickoff included an introduction from her former law professor, US Senator Elizabeth Warren, whose campaign Wu once worked for. A first-time political candidate, Wu finished fourth among eight finalists for the at-large spots in the Sept. 24 preliminary — securing almost twice as many votes as the fifth-place finisher. “I’m running because I’ve seen from my family experiences how important it is to have a city government that is accessible and responsible and focused on its residents,” Wu said. She said that her experiences raising her sisters, starting and operating a business, and working in City Hall following law school give her the perspective needed to bring new efficiencies to city services. The key, she said, is reaching out to residents who are most likely to be missing out — those who have little economic means or who do not speak English. Wu, who is still helping to care for her mother, said she would work to connect each constituent who calls with the right resources. Just a few years ago, she was on the other end of those phone calls. “I look forward to being an advocate, not just for the big-picture systemic issues but also for individuals who need help,” she said. Wesley Lowery can be reached at wesley.lowery@globe.com. Follow him on Twitter @WesleyLowery.